Do you practice letter formation in preschool by offering letter tracing worksheets? 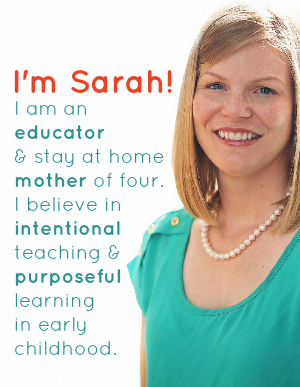 It really is a common practice, but not the best for early education. (I’m not judging, I’ve been there, too). Teaching writing to preschoolers should seldom involve a worksheet of any kind. Reason being is that there are better ways to practice letter formation. More effective and more meaningful ways. In my preschool, instead of using extensive and dull worksheets, I use fine motor journals to teach writing. One of my all time favorite things to teach in preschool is writing. Not exactly letter formation, but creative activities that lead children to enjoy writing. To enjoy the act of putting pencil to paper . You see, letter formation is difficult work for learning writers. While just a few basic shapes make up the entire alphabet, there are 26 different combinations to remember. Letter formation worksheets are common practice in a lot of preschools, but (let’s be honest here) they are kind of a kill-joy. Ok, maybe not completely. But mostly. I’ve had a handful of students who genuinely like handwriting worksheets. My own daughter was one of them. During the summer leading up to her kindergarten year, my daughter daily requested (yes requested) a letter tracing worksheet. She took pride in colorfully tracing the lines of the letters. But she is one of only a few of my preschoolers who have enjoyed letter tracing, and even fewer have benefited from them. What I have found about preschoolers is that those who like letter tracing tend to have good or advanced fine motor skills. 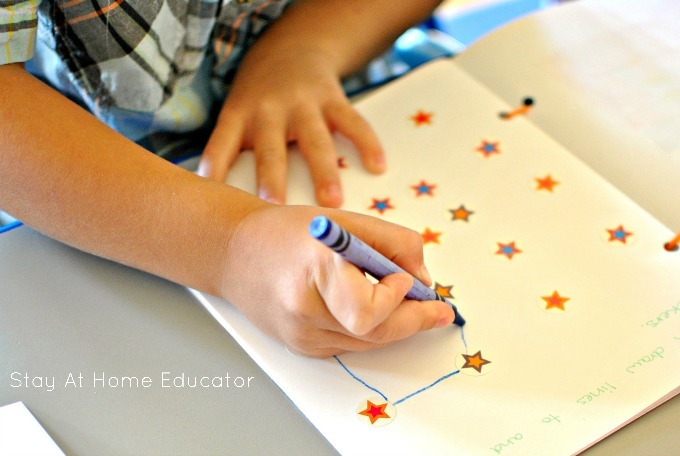 Writing comes with greater ease to them because they already use the correct pencil grip or tripod grasp. However, it is perfectly OK and much more normal for preschoolers to continue to develop the tripod grasp. During this development, preschoolers do not have the dexterity for writing worksheets and therefore tend to loathe the activity. For this exact reason I choose to do fine motor journals with my preschoolers. 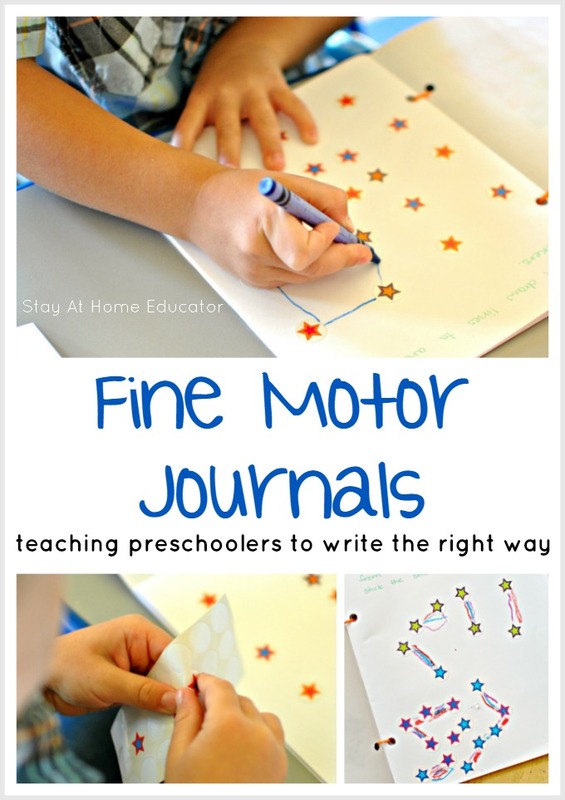 Fine motor journals provide the most excellent way to record fine motor work and develop writing skills. This paves the road for letter tracing on paper to be effortless when the preschooler is ready. What is a fine motor journal? 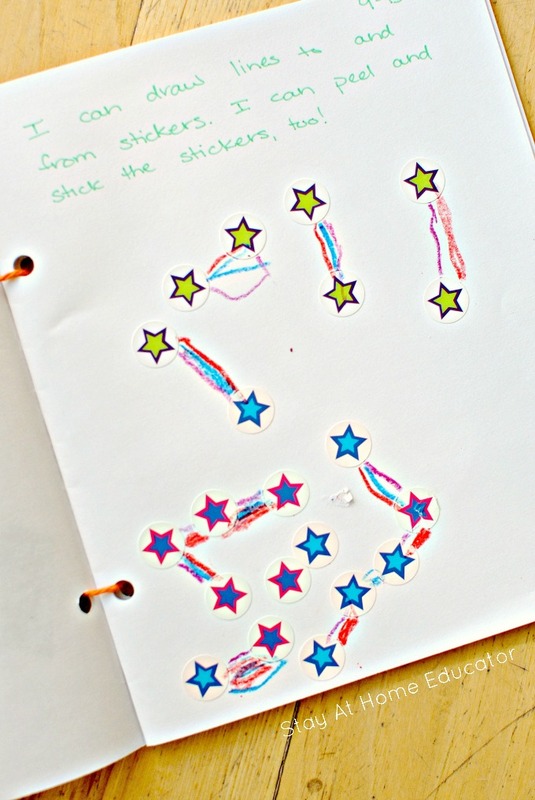 A fine motor journal takes a fine motor skill and a writing task and puts it into an on-going journal. The writing task is not a photograph, but it is an opportunity for the child to have complete control over what the task will look like. There are a number of excellent activities for developing fine motor skills, such as using tongs to transfer foam blocks or beading pipe cleaner . But there is nothing to show the parents from these activities. Parents like to be able to see what they are spending their money on. In lieu of demonstrating fine motor work and the development of writing skills to parents, I created the fine motor journal. The journal is “evidence” of the value of fine motor work and it tracks the preschooler’s progress. There are many activities to put into a fine motor journal. 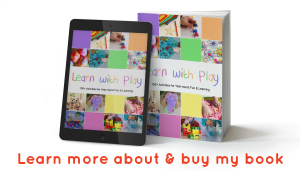 Frankly, just think of your preschooler’s favorite fine motor activities and find a way to put it on paper. 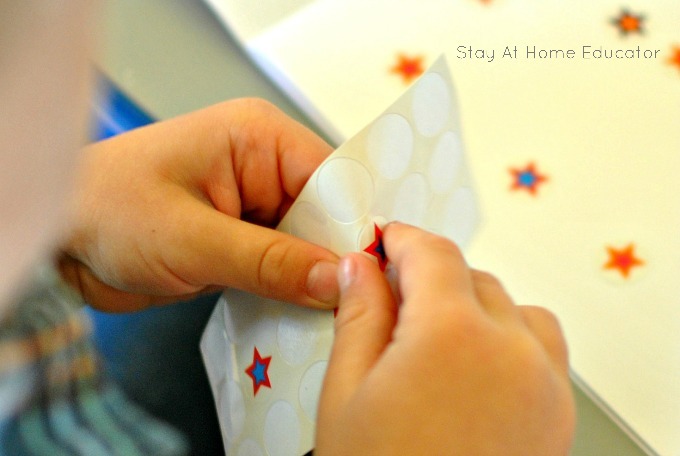 Some kids love picking and peeling stickers, and it is excellent work for developing fine motor skills. Picking and peeling naturally forces the fingers to work together to strengthen the pincher grasp, which is needed for many skills. Skills such as formal writing, zipping, and buttoning. I gave each student a sheet of 25 round stickers . The round shape is best, making it easier to peel them from the sheet without tearing. Less tearing means less frustrated children. Then I gave my preschoolers a set of crayons and invited them to draw lines between the stickers. This allowed the children to use traditional writing tools with purpose. Pictured below, the student chose to connect the stickers to make a picture like in a dot-to-dot. Another student, whom I’ve had in my class for two years, connected the stickers to make constellation stories, an activity we did during our space theme. Some children chose to draw circles around each sticker, while others simply drew lines between the stickers, over and over again. When practicing letter formation using letter tracing worksheets, a teacher or parent might tell a child, “No coloring. Just tracing.” The problem with this is that if a child’s pencil grip is immature, they have more control over coloring than they do single lines that go specific directions. That lack of control makes tracing very difficult for children who are still developing proper pencil grip. And that is exactly why I love teaching writing to preschoolers using fine motor journals. Preschoolers are given a basic task which they have the freedom to complete any way they choose. Fine motor journals are simply a few sheets of legal paper folded in half, hole punched , and strung together with some yarn . I keep them only a few pages long (maybe four sheets of paper, so about 8 two-sided pages) so that the children can take one home each month (or sooner if they work in them during choice centers). I also include the date and an “I can…” statement on each page. This gives the preschoolers a bit of confidence as I tell them, “You can…That helps you be a good writer.” And parents like the statements because it explains why we did the activity in the first place! Sometimes my preschoolers will draw stories alongside their fine motor work. In such a case I ask if they would like me to write down their story, which makes these journals all the more important and personal for my preschoolers. Come the end of the month, they proudly show their fine motor journals to their parents when they come for pick-up. The parents also have a sense of pride with the on-going record of some of the important fine motor work their child has done. My favorite part of the fine motor journal is that it pairs fine motor work with traditional writing tools, like crayons and colored pencils . Even more importantly, the activity is completed in a way that gives my preschoolers authentic practice in writing. You know, I don’t. But it is something I am working on! I would be interested in some training material or a collection of journaling tasks also. What a great idea! That sounds great. Can you send an email when that is completed? Absolutely! Are you subscribed to my blog? I’d like a list of activities you do within these jpurnals! I would love more information and activities on fine motor journal …Thank you! You are in luck! I’m hoping to put together a large list of activities! Great idea. I do lots of similar things and love using those little stickers in class, too. I amend my “writing” what a child say about their picture, or my explanation of what they are working on,, often, to the back of the paper, so the front remains “theirs.” They can still look at it if they want but it’s usually more for parents so I limit it to the back. Just an idea! Thanks fior your cool ideas…impresses with the Big Dipper kid! Thanks for the comment! It sounds like you and I have very similar approaches to teaching writing. When we do artwork, I write on the back of the drawing. My purpose for writing on the front for the fine motor journals is to help kids learn that writing (or in their case, peeling stickers or scribbling or whatnot) does have meaning. But I don’t always do dictated stories, either. Have you published more ideas for using these journals in the classroom? Not yet, but you can expect more this fall! I am wondering if you have the ideas for the journals put together yet? Thanks for checking back in about that. I have been working all summer on some ideas and plan to post them this fall. 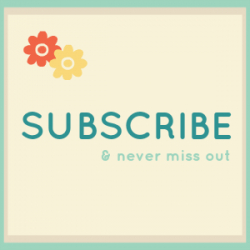 You are a subscriber to my newsletter, right?